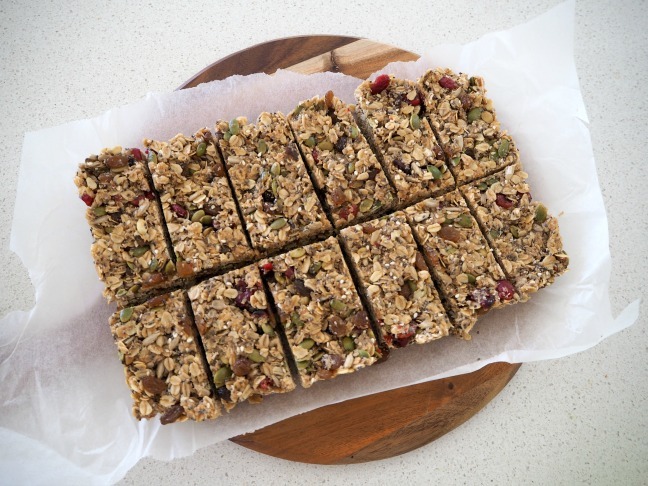 Muesli Bars are a staple in our house and both of my boys would happily eat one with every meal if I let them. 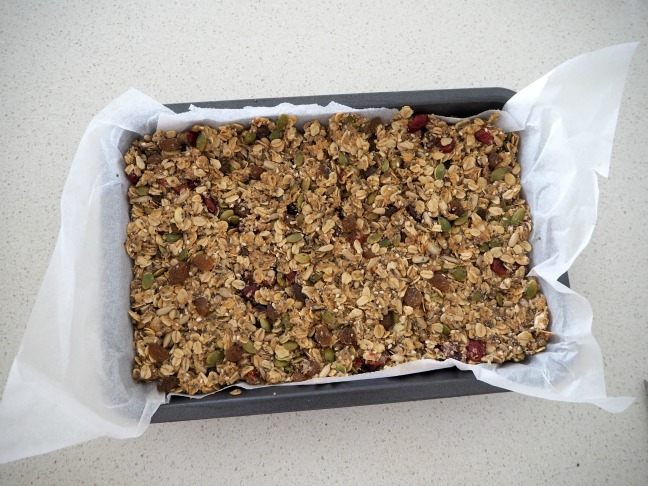 Given that store- bought muesli bars are not always the healthiest snack option (not to mention the cost! ), I’ve been making my own for the past few years. 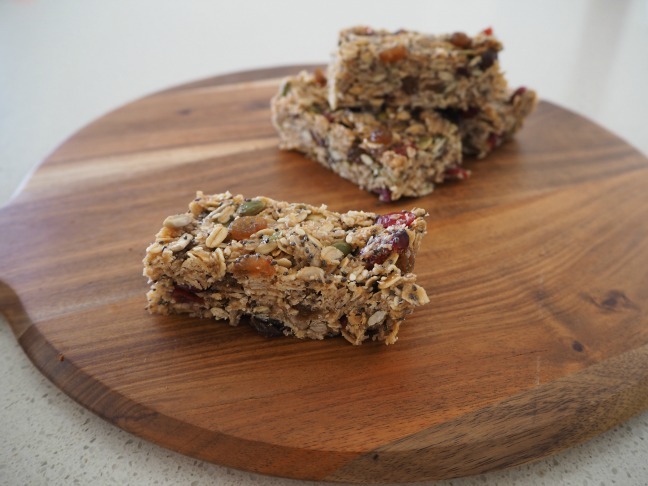 We’ve tried a few recipes and these chewy, nut free Muesli Bars are one of our favourites. 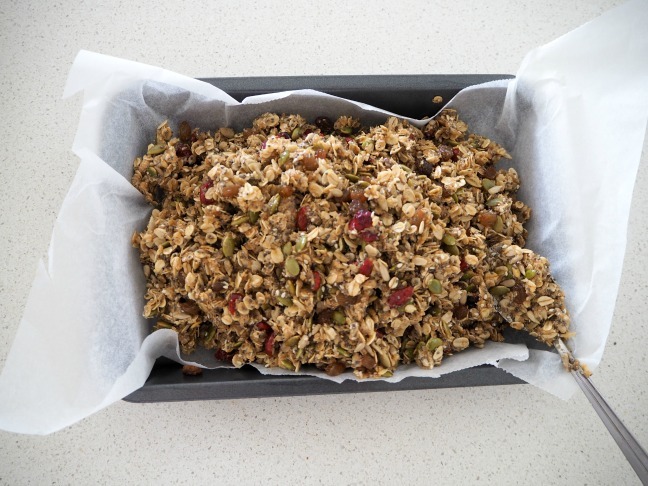 It’s the yummy combination of pepitas, sunflower seeds, sultanas and cranberries that sets them apart. As a bonus, Mr 4 is also very happy he will be able to take his favourite muesli bars to his nut-free school when he starts prep this year! I know I say it a lot, but this really is a super simple recipe to make. You don’t need to use your oven, simply melt and mix your ingredients together. Plus you can substitute the dried fruits and seeds to suit the preferences of your family or for whatever you have on hand in the pantry. I’ve made batches using dried apricots, banana chips and even a combination of sultanas, banana chips, apricots and chocolate chips as a special treat. 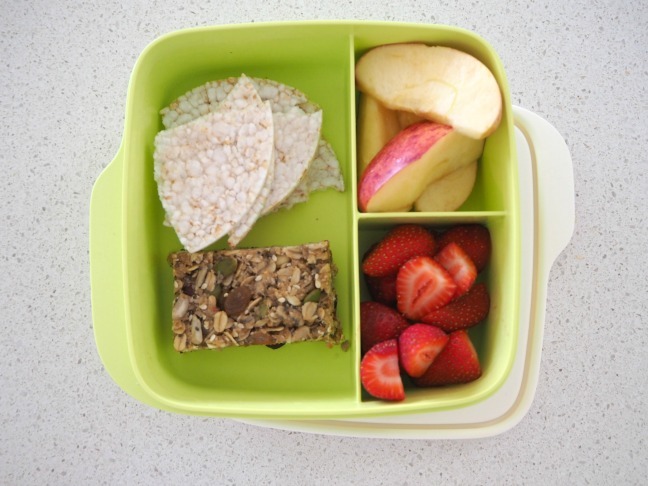 Although these are nut free and handy for school lunch boxes, as an at-home option, you can also easily substitute some nuts for some of the seeds if you like. I’d suggest trying almonds instead of sunflower seeds, you won’t regret it! Step 1: Line a 28 cm x 18 cm slice tin with baking paper making sure you leave some hanging over the sides to help you remove the bars once they have set. 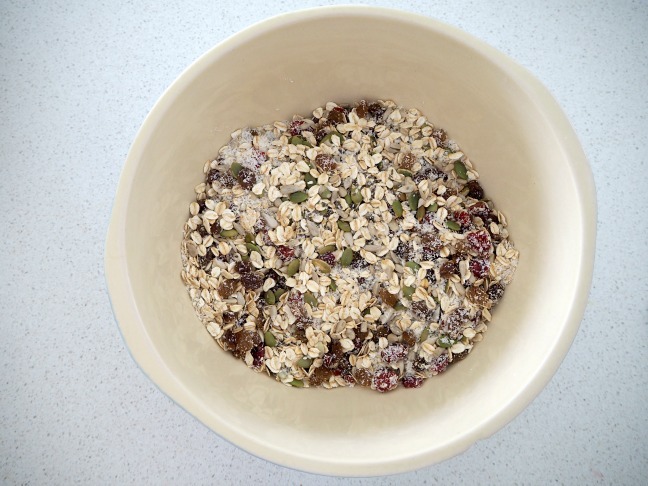 Step 2: In a large bowl, add the rolled oats, desiccated coconut, wheat germ, sultanas, cranberries, sunflower seeds, pepitas, sesame seeds and chia seeds and stir to combine. Set aside until needed. 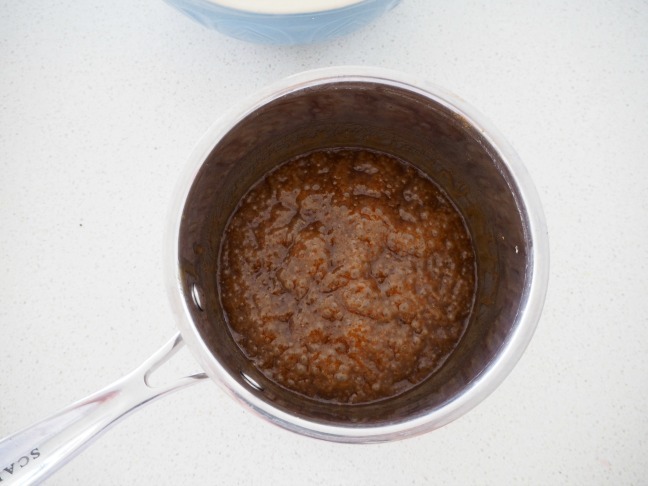 Step 3: Cut the butter into cubes and place it along with the rice malt syrup, brown sugar and cinnamon into a small saucepan.Heat over a medium-high heat until the butter has melted and the mixture starts to bubble and froth gently. Cook for a further 3 minutes until the sugar has dissolved and the mixture is a lovely deep brown colour. Step 4: Carefully add the butter mixture to the bowl with your other ingredients and stir to combine. Make sure all of the ingredients are covered with the butter mixture. Pour the mixture into your prepared slice tin and use the back of a spoon to firmly press the mixture into the tin to flatten the surface. It’s important to make sure it’s compressed so that it holds together well when you slice it into bars. Step 5: Place the slice tin into the fridge for 1 hour to firm before cutting into 12 pieces.